I know, I know….I haven’t posted here in a long time. 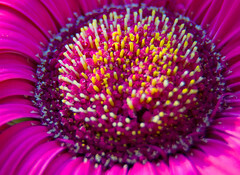 To make it up to you, here’s a gerbera daisy macro. I will give you a proper update on how things are going later in the week. In the meantime, enjoy! Previous PostEthan and DylynNext PostViews from Corolla, NC.